It is always worth asking. Firstly, sorry for the clutter, as this story could fit another thread there. Anyway the story. 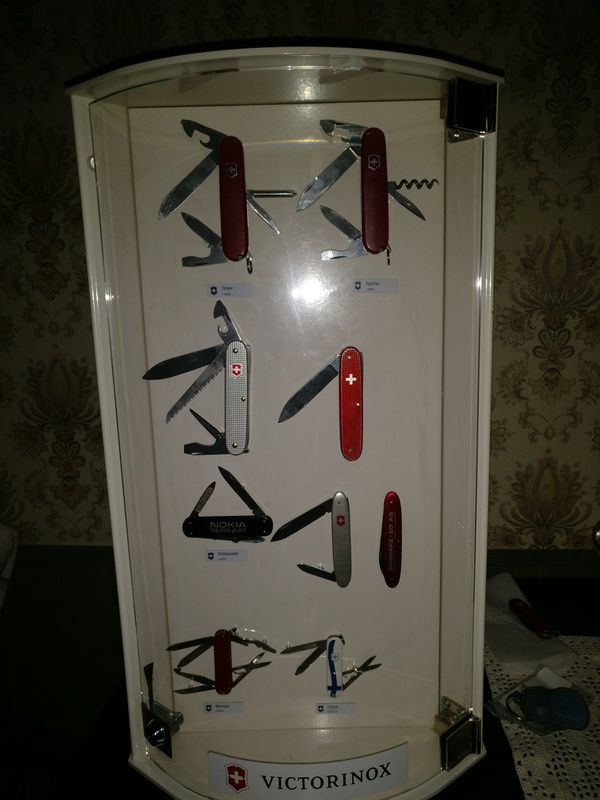 In November I noticed that a national chain dealing Victorinox had a clearance sale on almost all their Victorinox pocket tools and accessories, save some special limited editions like the jubileum, made for Finland's 100th birthday. Well I snatched a couple Spirit X:s one for me, one I sold to my brother at cost. 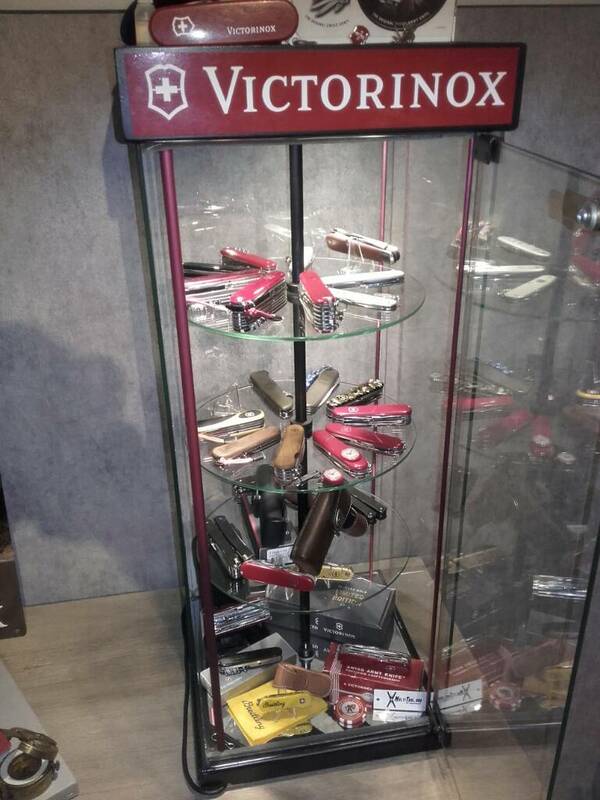 I was quite content but began to wonder, will they really stop selling Victorinox tools? Later I started to wonder, if so what'll happen to their paraphernalia, specifically displays. 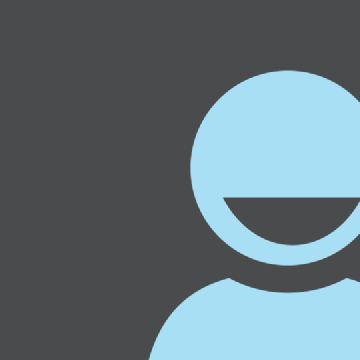 The pondering had slipped my mind for quite a while, but on January the fourth I decided to write an email to the importer. within I greeted them, gave condolences for the apparent loss of a major customer and then asked what'll happen to the displays. No answer it seems. Only on the 10th I checked my spam filter and discovered the sales manager had responded the same day, and had written a permission to give the displays to a collector for free! So I emailed a humble request to bunch of the stores that I or a friend could fetch one from. a few days passed, but on Monday I was given the go to get a freestanding display from one, which is still on the way. on Tuesday I was promised what I was chiefly after: a TableTop display. so they kept it for me, and yesterday when visiting my sister in that city I fetched it. Now, after once again thanking the people involved and sending it there finally some PICCCCSSSSS!!!!! for you. PS. I made some deliberate label mistakes due to not having the precisely right ones, point ones you find out as a little game if you want. Re: It is always worth asking. I got myself a Leatherman banner like that a couple of years ago. 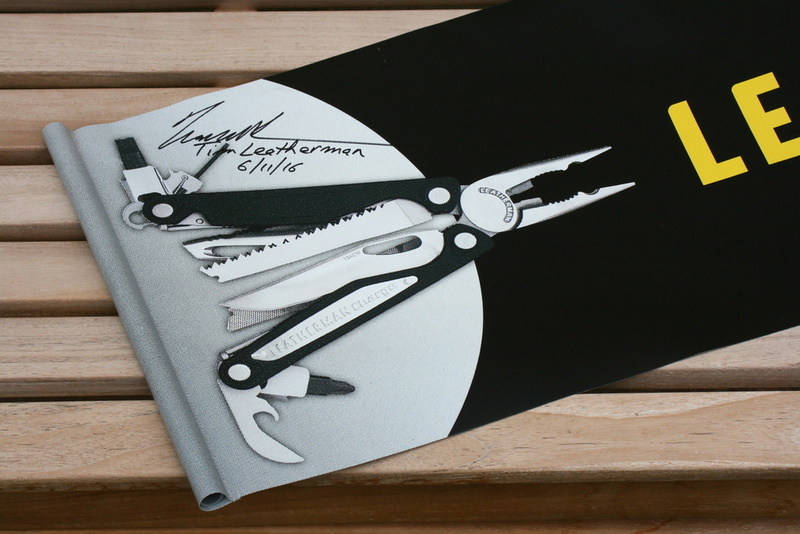 Went to a local outdoorshop, noticed they had a Leatherman banner (with a Charge on it) hanging on the side of a shelf which carried clothes on sale, so I asked the store owner if the Leatherman Banner was for sale also, and he just gave it to me . A couple of years later I met Tim Leatherman in another outdoor store to have some of my tools engraved/signed, and I took the Leatherman baner with me and Tim signed that one as well . I got some Wenger stuff a few years ago, from the main dealer, when Wenger stopped making SAKs, by asking nicely and buying a few things. Those are some great finds everyone, and not just the stuff but knowing that there's people who would go the extra mile for nothing more than a stranger's smile. Well ok discontinued or signed merch is awesome as well. Oh, was anyone interested in my little spot the error/identity the SAK task? There's tips on the captions. can someone please repost the pics? I can't see them unless I open a 1 drive account. Well my only display was bought. But then again, it's electricaly lighted and rotating. Damn, Microsoft doesn't apparently like new accounts solely for image hosting, the account apparently was closed. but I'll try to post an alternate link soon so you can . Meanwhile Mechanickal seems to have great stuff as always. EDIT Reuploaded album. at least to my sleep deprived mind the captions are a little improved as well. A signboard my dealer didn´t want anymore. I didn´t even have to ask, he offered it to me for free. I've managed to pick up a few items. Unfortunately had to pay for all of them. there's the reuploaded pictures requested, wonder if a mod can put the link somewhere easy to find, if we balloon the thread it'll be annoying to roll around just to look to see what even started it. - I think I saw your tip on the Manager - But could not see why it was not a Manager!! great spots, for the manager, zoom and count, you'll find something amiss. another one is related to numbers as well. Have you got easy access to brochures, Gath? Have to admit that my display pic was an older one. To be honest as I've scarcely needed them before I've neglected to seek any. However I believe if they were easy to find I would have already found some searching for knives. I could ask the importer again, but I'd feel bad just asking and asking for stuff. Besides they'll probably not have older ones that could be more interesting. But maybe I'll get lucky if I ask around again. PS. The importer representative responded to me and said he'll send me a guide for knife displays and tell me first if they'll get any interesting limited editions. Anyway, there's the display improved. I know a guy who's got some spares but I rarely meet him. I'll ask him next time I go over there though! If I'm able to get a few I'll send them over. Oh, that's just too kind of you. I´ve heard the same. Half opening tools puts a lot of pressure on the springs. Leave them closed or open all the way. I do the same, just to be sure. You asked to give stuff to me though, I may have identified the flaw in your technique for getting free stuff. And I hear you all about the springs, but I guess we can put the theory to the test now. 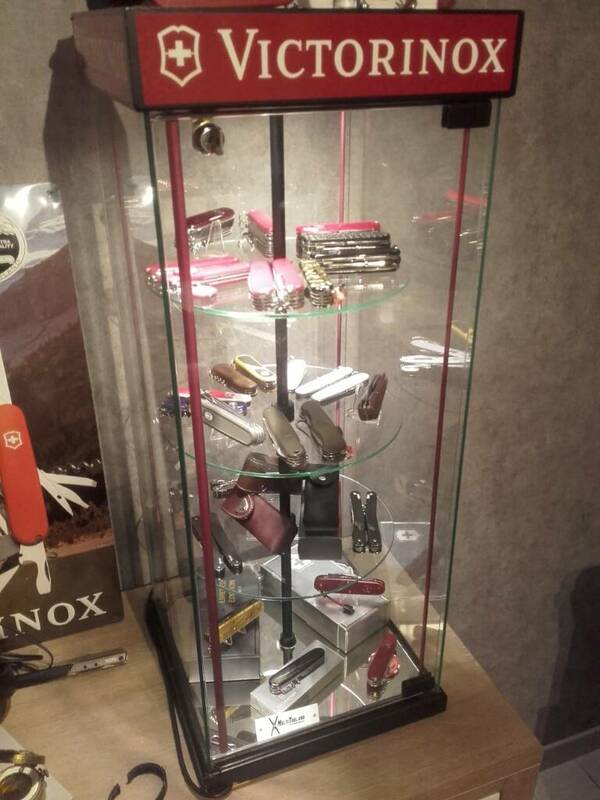 None of those knives are exceedingly rare yet, the only Elinox, the red secretary, I left closed. And they're certainly not already weakened, the Spartan almost chopped the top of my thumb off. Of course some here have probably bought display models, any observations? 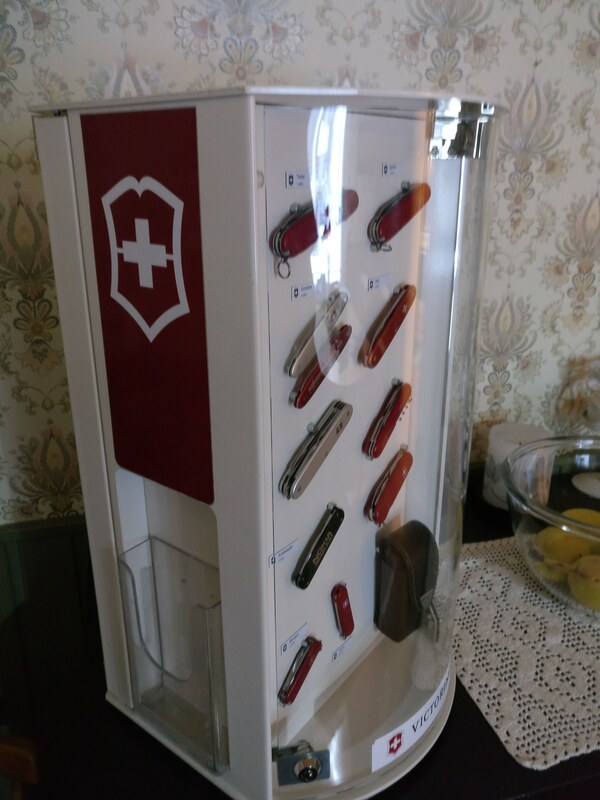 And I hear you all about the springs, but I guess we can put the theory to the test now.bNone of those knives are exceedingly rare yet, the only Elinox, the red secretary, I left closed. 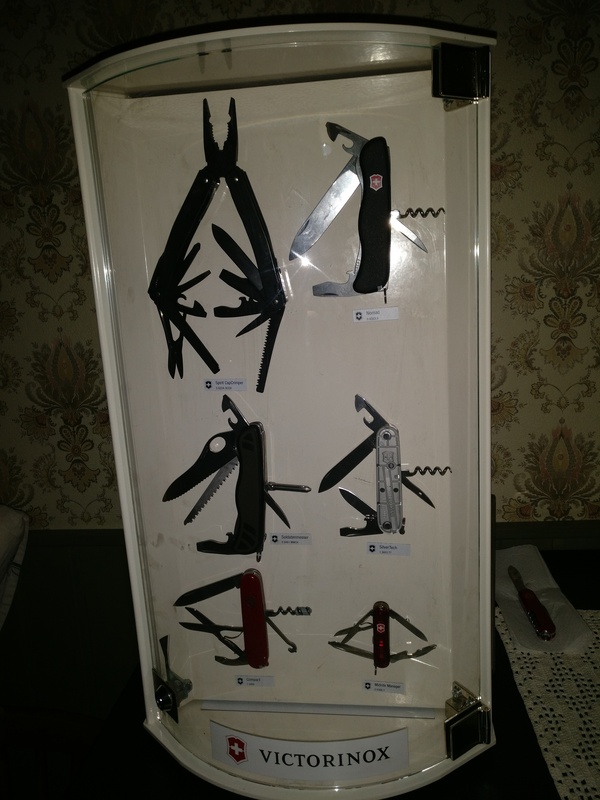 But I must say that your display looks awesome with the knives/tools open, it wouldn't look half as nice with the knives closed ... tough choice . Oh I just remembered, my own EDC Spirit is actually a display model as is the one I bought for my brother, and those at least haven't loosened, in fact you still really can't lift the Phillips with your nail, a common feature in new Spirits.